What are Castles and Why are They Important? Originally, a castle was a fortress built to protect strategic locations from enemy attack or to serve as a military base for invading armies. Some dictionaries describe a castle simply as "a fortified habitation." The earliest "modern" castle design dates from Roman Legionary Camps. The Medieval castles we know in Europe were constructed of earthwork and timber. Dating as far back as the 9th century, these early structures were often built over ancient Roman foundations. Over the next three centuries, wooden fortifications evolved into imposing stone walls. High parapets, or battlements, had narrow openings (embrasures) for shooting. By the 13th century, lofty stone towers were popping up across Europe. The Medieval castle at Penaranda de Duero, northern Spain (view photograph) is often how we imagine castles. People seeking protection from invading armies built villages around established castles. Local nobility took the safest residences for themselves—inside the castle walls. Castles became homes, and also served as important political centers. As Europe moved into the Renaissance, the role of castles expanded. Some were used as military fortresses and were controlled by a monarch. Others were unfortified palaces, mansions, or manor homes and served no military function. Still others, like the plantation castles of Northern Ireland, were large homes, fortified to protect immigrants like the Scots from the resentful local Irish inhabitants. The ruins of Tully Castle in County Fermanagh, uninhabited since attacked and destroyed in 1641, exemplify the 17th century fortified house. Although Europe and Great Britain are famous for their castles, imposing fortresses and grand palaces have played an important role in most countries around the world. Japan is home to many impressive castles. Even the United States claims hundreds of modern "castles" built by wealthy businessmen. Some of the homes built during America's Gilded Age resemble fortified habitations designed to keep out perceived enemies. A castle built as a military stronghold may be called a fort, fortress, stronghold, or stronghouse. A castle built as a home for nobility is a palace. In France, a castle built for nobility may be called a chateau (the plural is chateaux). "Schlösser" is the plural of Schlöss, which is the German equivalent of a castle or manor house. Why do we care about castles? From the Middle Ages to today's world, the planned communities and system of social order of medieval life have become romanticized, transformed into a time of honor, chivalry, and other knightly virtues. America's fascination with wizardry didn't begin with Harry Potter or even Camelot. 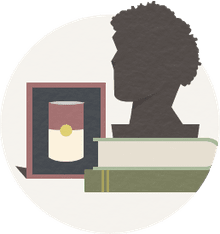 The 15th century British writer Sir Thomas Malory compiled the medieval legends we've come to know—the stories of King Arthur, Queen Guinevere, Sir Lancelot and the knights of the Round Table. Much later, Medieval life was satirized by the popular American author Mark Twain in the 1889 novel A Connecticut Yankee in King Arthur's Court. Later still, Walt Disney placed the castle, modeled after Neuschwanstein in Germany, at the heart of his theme parks. The castle, or the fantasy of the "fortified habitation," has become part of our American culture. It has also influenced our architecture and house design. 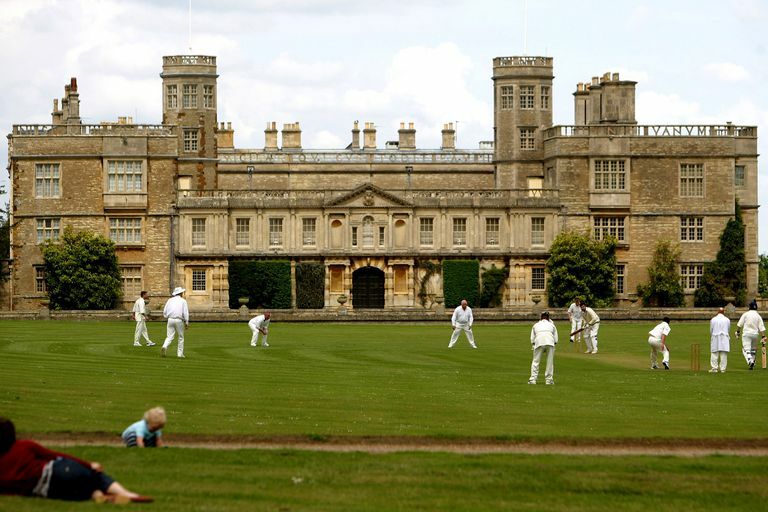 Watching a cricket match on the grounds of Castle Ashby, the casual travel might have little sense of the historical architecture in the background. Sir William Compton (1482-1528), an advisor and soldier in the court of King Henry VIII, bought Castle Ashby in 1512. The estate has been in the Compton family ever since. However, in 1574 the original castle was demolished by Sir Williams' grandson, Henry, and the present fortification began being constructed. The first floor plan was shaped like an "E" to celebrate the rule of Queen Elizabeth I. In 1635, additions squared off the design to create the inner courtyard—a more traditional floor plan for a fortified habitation (view floor plan of Castle Ashby's first floor). 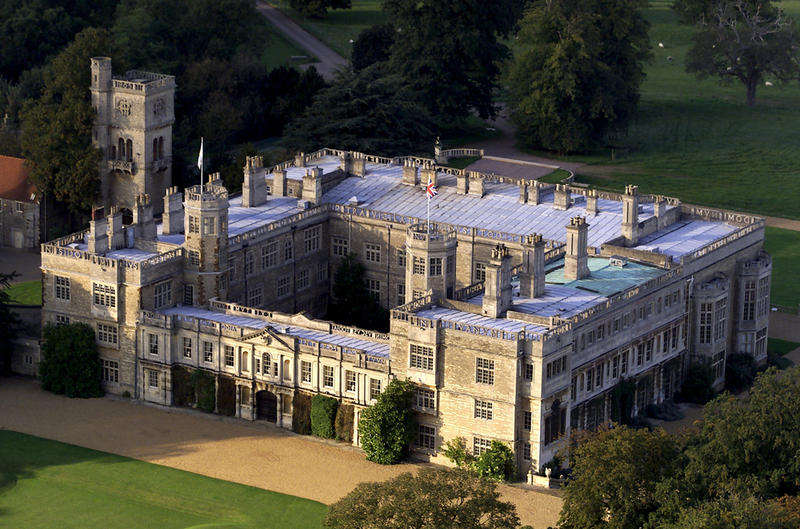 Today the private estate is not open to the public, although its gardens are a popular tourist destination (aerial view of Compton Estates, aka Castle Ashby). The design ideas behind the European architecture of England, Spain, Ireland, Germany, Italy, and France traveled across the Atlantic Ocean to the New World along with the pilgrims, pioneers, and immigrants from those lands. European or "Western" architecture (as opposed to the "Eastern" architecture of China and Japan) was built on a European historical heritage—the architecture of castles changed as technology and the needs of the inheritors changed. So, there is no one style of fortification, but elements and details keep reappearing in architectural history. Great Hall—Is your living room ever big enough? That's why we finish off basement spaces. A communal living area is a tradition handed down for centuries. Australian architect Glenn Murcutt designed the floor plan of the Marika-Alderton House in a way that is strikingly similar to a quarter section of Castle Ashby. Tower—The tower is directly related to the Queen Anne style Victorian home. The protected stairway protrusion of the 1888 Rookery Building in Chicago is remarkably similar to the towers set in the courtyard of Castle Ashby. Keep—Castles often had one large, self-contained tower, as a retreat of last resort. Today, many homes have storm cellars or a safe room in case of emergencies. Center Chimney—What reason do we have for a fireplace in today's centrally heated home? Houses today may not have as many chimneys (or chimney pots) as has Castle Ashby, but the tradition remains. Habitation by Function (wings)—Areas of a castle or fortified mansion are often divided by activities, public and private. Bedrooms and servant quarters are private functions while grand halls and ballrooms are public functions. American architect Frank Lloyd Wright took this design idea to heart, most notably with Hollyhock house in California and Wingspread in Wisconsin. More recently, two wings of separation can be found in Perfect Little Houses by Brachvogel and Carosso. Courtyard—The enclosed courtyard was part of the design for early luxury apartment buildings like the Dakota in New York City and for office buildings like the Rookery in Chicago. Secondarily for safety, the inner courtyard afforded larger buildings with natural light to more of the inner spaces. Landscaping—Why do we cut our lawns and manicure the land surrounding our homes? The original reason was to keep an eye on our enemies and potential attackers. While that may still be the reason in some communities, today's landscaping is more of a tradition and social expectation. What Do You Know About Mexico's Chapultepec Castle?